Every day of the week we have a dish we truly believe to be special. These are all created here at The Pun Pun in home cooking style. Our promise... you'll never leave here hungry! 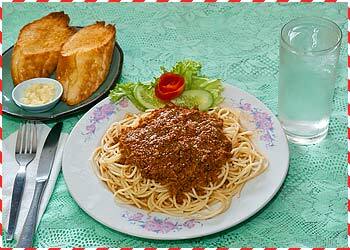 Pun Pun's spaghetti is indeed a 'special', with a meat sauce of our own recipe that only a mother could make! Served with fresh toasted & buttered garlic French bread. Once, while driving around in my pickup with my pet donkey in the back, I discovered I had a flat tyre. I got out and had the donkey stick its head under the bumper and lift up the rear of the truck. A passing farmer asked me, "Hey, thats a pretty clever trick. How did you teach your donkey to lift the truck?" I replied, "Its a simple matter of the breed; this is a jackass!"